This glossy stoneware dog treat jar from Rae Dunn is the perfect balance between fun and refined. Not too flashy and not too campy with just the right amount of minimalist chic, it’s a celebration of all the ‘Good Dogs’ we’ve ever loved. These unique poodle salt and pepper shakers from Jonathan Adler should only go to someone on your list as equally unique and dog-obsessed. These pooch-inspired shakers will match with the design of any kitchen with their neutral, gloss finish while still reflecting the one-of-a-kind personality of their owner (especially anyone with an affinity for poodles!). The title of Elias Weiss Friedman’s latest creation practically speaks for itself. It is an unabashed celebration of all that is puppy. 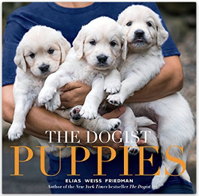 If you do not already follow @thedogist on Instagram or haven’t seen his previous New York Times bestselling book, let me go ahead and give you an early Christmas present by suggesting you do both immediately. Friedman’s latest book is an expansion of his photo-documentarian style, a series of portrait galleries put to page with each picture accompanied by a story that explores each little subject’s unique personality and spirit. It is a kind of literary monument to all the reasons we love dogs, and especially puppies. When I first came across these custom pillows, I couldn’t help but laugh at how quickly I thought of the perfect person to give one to. This one-of-a-kind pillow is for the person who refers to their pets as their children or even spoils their pets MORE than their actual children (you know the one). All jokes aside, these custom-made silk-screen pillows – created using a photo of the pet – are an incredibly thoughtful way to spread the love to all your pet-obsessed friends and family this holiday season. Let’s face it, the days of walking the dog or even taking them out for a quick potty-break being a menial chore are long behind us. Now, any chance to step out with your furry companion is an opportunity for a stylish outing, especially with this handcrafted leather case. Available in 6 different colors, you can even get your dog’s name engraved on the case for free! Pair it with a personalized leather leash (also found on Horchow) for a gift that is equal parts stylish and personal. If you have an athletically-inclined friend who loves to be active with their dog, ask them if they ever struggled with their traditional hand-leash while out on a run, hike, etc. Chances are, they could use Tuff Mutt’s revolutionary hands-free leash system. A 4ft.-extendable bungee leash, easy-clip belt, and two separate leash handles allow for ease-of-use and complete control without having to stop or break stride, reducing shock on both pet and owner! It doesn’t take long for that oh-so-special wet dog smell to set into your house, and it can leave you scrambling to find an effective solution when entertaining guests or enjoying the day indoors. 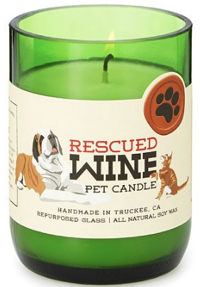 Thankfully, these hand-poured, small-batch 100% soy-wax candles (made with repurposed wine bottles) do more than just eliminate unwanted pet odors. A medley of citrus, fresh grass, and clean herbs are combined with an infusion of essential oils, providing soothing aromatherapy and a fresh, serene scent for any dog-lover’s abode! While this is more of pet-specific gift, the ease-of-use and overall convenience of this Pet Bowl Water Bottle for on-the-go dog lovers is just too great to pass up. No more separate containers and no more bulky collapsable bowls. 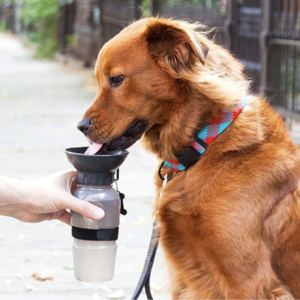 With a squeeze of this leak-proof, design-patented water bottle, the attached dish fills up with water for your thirsty pooch! Excess water flows back into the bottle to reduce waste, the velcro strap allows for easy attachment to any bag, and the bottle itself fits in a standard car cup holder.